This is our most popular tour option. It combines our 2 most popular tours into an eight-day action packed tour, including Normandy and WW1. This tour starts in Bayeux, Normandy or Arras. It is your responsibility to get to Bayeux (or Arras) to begin the tour and to make your own arrangements for travel wherever the tour ends. However, all other travel will be included in the tour cost. Day 5, 6, 7 & 8 – Your four-day WW1 tour will begin when your guide picks you up at your accommodation, in Arras. 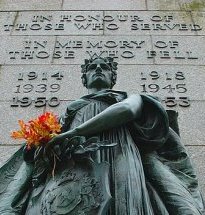 The following link will give you the itinerary for your four-day WWI tour – http://www.canadianbattlefieldtours.ca/ww1-battlefield-tour/. Of course, the tours combined in this package are still available on a stand-alone basis or any combination thereof, that best suits your interests. This tour, as well as our others, will be costed on the following basis. The price quoted will be for all ground transportation within the battlefield areas, with professional guide(s). It does not include anything else. Of course, we are happy to make recommendations to help with your travel planning, like hotels, B&B’s. With this tour, the planning will be quite simple. The cities where you will need accommodation Bayeux – four nights; Arras – three or four nights; both are larger centres with many choices. There are many hotel booking sites but we have always liked https://booking.com.